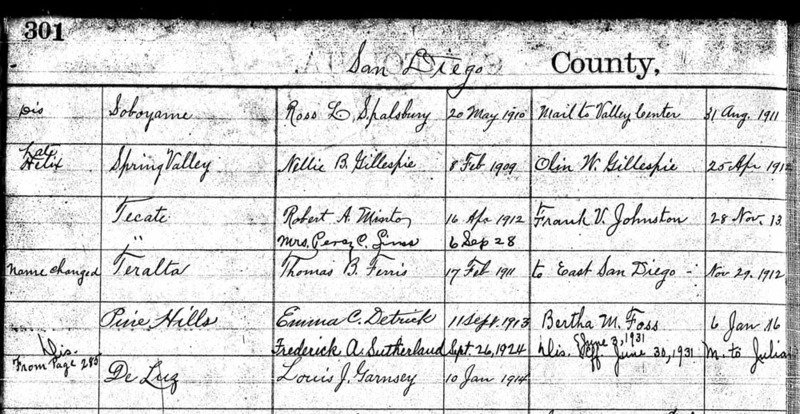 Entry for Louis Garnsey (bottom) as postmaster of De Luz, California, from Record of Appointment of Postmasters, National Archives and Records Administration. “Louis J. Garnsey has been appointed postmaster at Deluz, San Diego county,” stated the short notice in the San Diego Union of January 11, 1914. Louis Garnsey was a busy man, growing grapes, apricots, olives and grain on the family ranch in De Luz Canyon, eight miles north of Fallbrook. The canyon had experienced somewhat of a boom beginning in the 1870s. There was an influx of homesteaders who built thriving ranches over the next two decades. The establishment of Judson’s Mineral Springs Resort in 1881 helped lead to the building of a railroad station in the canyon. But by 1910 the resort had closed, and in 1916 the railroad station was swept away by a flood and the railroad re-routed out of the area. But Garnsey and some others stayed on, creating a distinctive rural community. Garnsey’s tenure as postmaster would last 16 years, and earn him an extensive article in the Union of May 20, 1928 for what the paper called his “piggly-wiggly post office.” The article provides some insightful impressions of Garnsey, his community, and county life in general at that time. The post office was a tiny building in the yard near his ranch’s farmhouse, a not unusual circumstance in San Diego County during that era. It should be pointed out that another newspaper article about Garnsey’s ranch in preceding years described deliveries of produce way off the farm, specifically a delivery of 4,000 boxes of grapes to Santa Ana, with another family member “acting as salesman and distributor.” So Louis may not have left his property very often, but his produce sure did.